Mount St. Helens erupts explosively in 1980. Image courtesy of USGS. Scientists realized long ago that no two volcanoes erupt the same. Some, like Mount St. Helens, burst violently and send ash and gas high into the air. Others, like Kilauea in Hawaii, ooze red hot lava which runs like maple syrup down the slope of the volcano. Many factors control how a volcano will erupt. Understanding these controls is a large part of the science of volcanology. 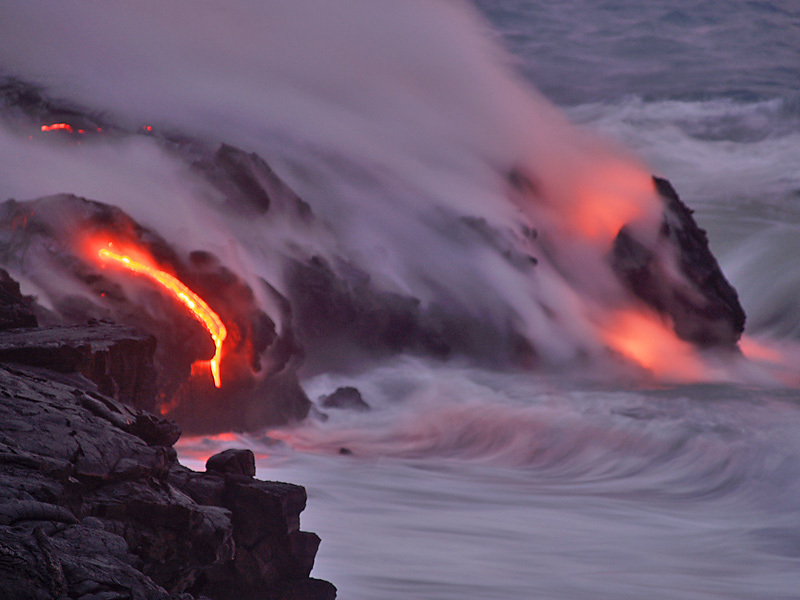 Lava oozes into the sea in Hawaii. Image courtesy of USGS. Effusive eruptions – magma rises through the surface and flows out of the volcano as a viscous liquid called lava. Explosive eruptions – magma is torn apart as it rises and reaches the surface in pieces known as pyroclasts. 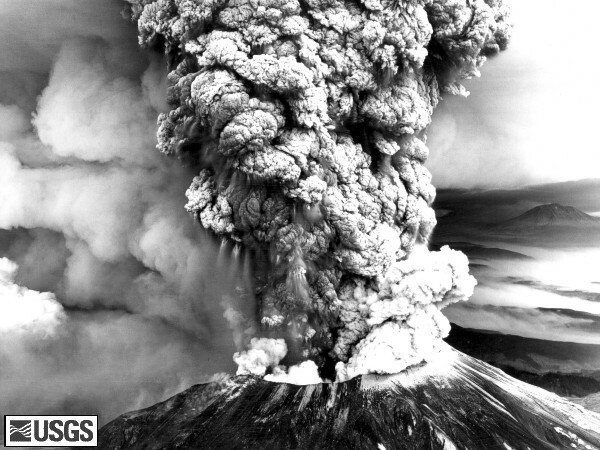 Thinking back to our earlier examples, the catastrophic May 1980 eruption of Mount St. Helens can be confidently classified as an explosive eruption. The common image of red hot lava flowing down Kilauea and covering roads and houses is an effusive eruption. 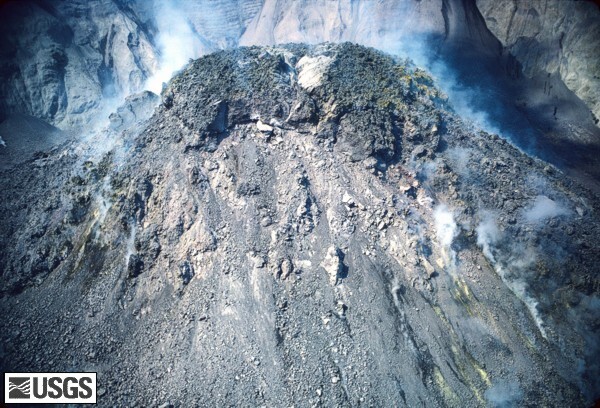 However, predominantly explosive volcanoes such as Mount St. Helens can show effusive behavior, such as the dome growth stages following the 1980s explosive eruptions and again in 2004 (image to left). Hawaiian volcanoes often exhibit fire fountaining, which can be thought of as an explosive eruption style (image to right). Why do volcanoes behave in such different ways? Whether a volcano will erupt explosively or effusively is determined by the presence of bubbles. Magmas contain many different gases such as H2O (water), CO2 (carbon dioxide), SO2 (sulfur dioxide), HCl (hydrogen chloride) and HF (hydrogen fluoride). Deep within the earth as the magma resides in a magma chamber , these gases are comfortably mixed into the magma. As magma rises towards the surface, though, the gases are no longer comfortable within the melt and come out of the magma to form bubbles. In some situations, bubbles form very easily. Sometimes, though, bubbles are not able to form. When a very bubbly magma reaches the surface, the bubbles pop and send shards of magma flying in every direction as pyroclasts. A magma without bubbles will simply ooze to the surface. 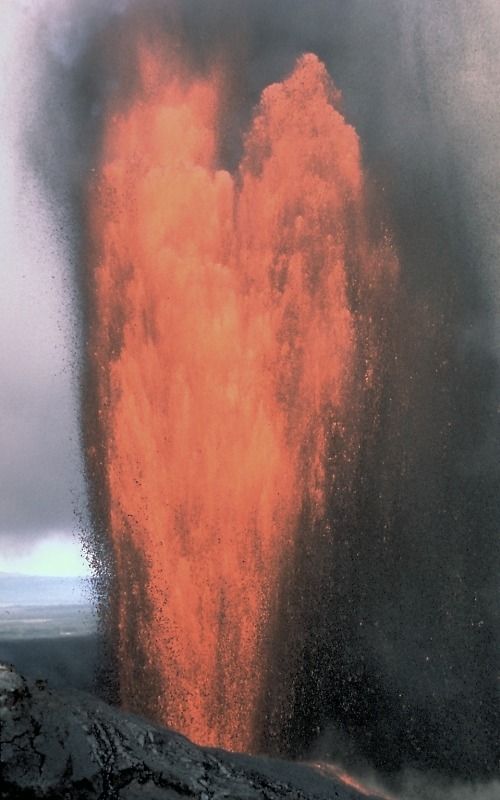 In the image to the left, bubbles form deep in the conduit of the volcano and rise to the surface, fragmenting the magma. This volcano erupts explosively. If bubbles formed higher in the conduit, the magma would not fragment as much and the volcano would erupt more effusively. Bubbles control a factor known in volcanology as explosivity. The more bubbles a magma develops, the higher the explosivity of the eruption. 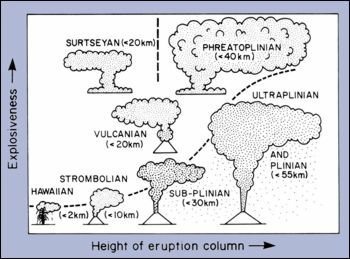 To better classify the size of volcanic eruptions, volcanologists developed the Volcanic Explosivity Index (VEI) to categorize eruptions. The VEI scale starts at 0 and has no upper limit, but the largest eruption in history was a magnitude 8. Using explosivity and the height of the eruption, volcanologists have developed a naming scheme for eruption styles. The graph below illustrates the different eruption styles based on explosivity and eruption column height. Click the links to the right to learn more about these different eruption styles.